Oh joy is me, the third and final book of a fantastic sci-fi trilogy I discovered last year finally has a cover to go along with its intriguing blurb. And the best news? Less than four months before it releases! Countdown starting now. “Corporate assassin Tamarland Benteen’s last hope is the survey ship Vixen. With a load of scientists aboard under the supervision of Dr. Dortmund Weisbacher, Vixen is tasked with the first comprehensive survey of the newly discovered planet called Donovan. Given that back in Solar System, Boardmember Radcek would have Benteen’s brain dissected, he’s particularly motivated to make his escape. That’s a new to me one! Cool looking cover too! Hope you enjoy this one once you read it! I’m so glad that this one finally has a name and a cover. I will be reading Abandoned soon and am so glad you loved it as much as Outpost. I sort of have an issue with this cover as I don’t really feel it compliments the others. Also, I’m not sure I like the floating head. The skull and the chalice (?) though – very awesome! I hope you’ll enjoy Abandoned! It carries the series really well. 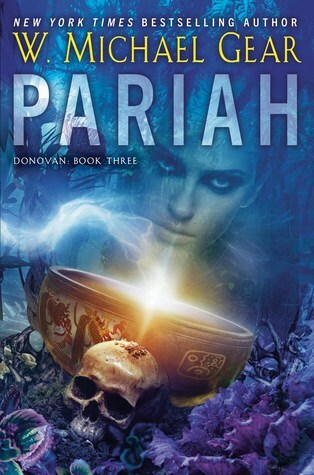 Yeah it’s a nice cover, though this series seems to have a serious thing for skulls! Sounds like an interesting series! It’s always nice when a series is wrapping up because one less you’re in the middle of, yet it’s somewhat bittersweet saying goodbye sometimes! Hope this is a satisfying conclusion! Eek, I hope you enjoy Abandoned! I can’t wait to hear what you think. Woah. I remember seeing the first two (probably here) and being really intrigued. Sounds like a tense conclusion too! That is a really pretty cover! I like the use of colour. I like the blue too! Though like Barb mentioned, it is sort of a departure from the covers of the other books in the series.